Jaipur : To engage more closely and provide a richer customer experience to the residents of India’s pink city, Vodafone India today launched 1st Global Design Store in the walled city of Jaipur. With this store launch Vodafone Rajasthan has reached its retail footprint to 32 company owned stores including 14 Global Design Stores in the state. Warm, customer friendly design, vibrant colours, easy navigation and enthusiastic customer service executives is what will welcome you the next time you walk into Vodafone’s Global Design Store in walled pink city, Jaipur. Since, Vodafone velue its loyal customers, it always cares and surprises them through innovative ways. 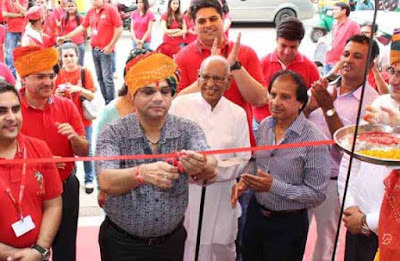 Following the same, Vodafone invited Alok Haldiya, a 15 years loyal customer to inaugurate the store today. Having inaugurated the new store, Thomas Reisten, CFO, Vodafone India, said, "Vodafone has always have been at the forefront in providing best in category products and services to our valued customers. With the launch of one more Global Design Store in Jaipur, we are extending a global service experience to a larger customer base in the city." He further added, "we are also happy to say that as we expand our footprint in the state, we are also employing more Rajasthanis and inducting them in to the Vodafone India family." Speaking on occasion of the launch of the new Vodafone Global Design Store, Amit Bedi, Business Head - Rajasthan, Vodafone India said, "As has been the trend with most other cities in India, Jaipur is becoming a city of increasingly technology savvier residents." Vodafone Global Design Stores are in line with Vodafone’s ‘Retail of Tomorrow’ initiative to deliver an unmatched retail experience to customers. As the name suggests, Vodafone Global Design Stores have a standard design format globally. Thus, from Jarrow in UK to Jaipur, customers enjoy a similar enriching experience. With increasing use of smart-phones, mobile internet and new technologies, customer tastes are evolving speedily. The launch of this store is in sync with the dynamic needs of Jaipurites. As local residents have been increasingly getting more and more inclined towards the use of smart technology, Vodafone has been at the forefront in facilitating this. An easy, simple design and welcoming and engaging staff, at Vodafone Global Design Stores provide a one-stop shop experience platform for customers, facilitating a more connected relationship between the customer and the brand. Customers at Vodafone Global Design Stores are offered an array of services through specially-designated zones such as 3G Zone to discover and experience mobile internet; Vodafone Red Zone: a first-of-its-kind all-in-one post-paid service; Self Service Kiosk: a 24x7 facility for bill payment and recharge service;Vodafone Red Box: to enable customers to transfer content from an existing handset to a new age smart-phone for free; and M-Pesa Zone: a unique mobile money transfer service.